Yes, it’s that time of year again – not just the time when Santa stops by, although that’s pretty important too – but the time when Spain goes plain insane over their annual Christmas lottery draw. 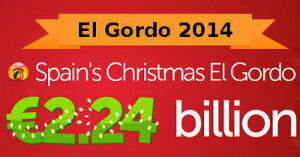 Known outside Spain generally as just ‘El Gordo’, the Christmas draw is the one with the prize pool of over €2 Billion. It pays out a ridiculous number of prizes included 180 jackpots! So this is a game I personally love to add to my Christmas stocking. So if you’d like to join me, then jump in a syndicate for El Gordo de Navidad today. Seriously, don’t wait because tickets are strictly limited for this raffle style draw and they always sell out early. The big draw itself will take place on 22nd December, and itself is a spectacle to see (you can see a previous draw here, and find out more about the game).